Imagine driving. Your windows are rolled up. The weather outside is way too much. You reach over to blast the air. Air blows out. It feels nice. Then, suddenly, cockroaches burst out from the vents. A couple of tiny ones fly towards your face. It’s not too common to suffer this horror and have to ask how to get rid of roaches in your car…but the possibilities are there and the time may come when you just might have to. There have been several cases scattered across the internet where others have had to ask this very question. Let’s be honest here. We eat in our cars. If you’re like me and have kids, there’s really no way to avoid eating in our cars. There are crumbs, spills, and wrappers all over the place–and we just cleaned it like a week ago. We leave open soda cans to sit in there. After we stop at the drive through, it usually takes us a few days before we get to throwing out the bags and whatever was leftover in there. Sometimes we’re too busy, so it takes a little bit of time before we get to vacuum those crumbs we dropped in the car. 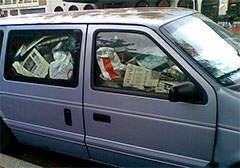 You have roaches in the car because they’re able to find food there. Remember, roaches are only attracted to the three things they need to thrive. I’ve already covered them in-depth in my other post. Eliminate what they need to survive and they will either die off, or leave for a greener pasture (hopefully your home isn’t considered when they do). You have to stop eating in the car. The problem won’t go away if you keep feeding them. You need to clean the car thoroughly and do so very often. Take off everything that you can like floor mats & seat covers. Use a vacuum cleaner to clean them and the area underneath before putting them back. If you can, leave them out until the problem is solved. The less places they have to hide, the easier it will be to get rid of them. Remember that roaches will eat almost anything. Remove as much clutter as you can and get rid of things like paper and cardboard. They will eat the maintenance manual if they have to. They will even eat the dirt on the carpet. Some people have suggested taking measures like bombing the car with bug bombs, or letting them cook under the summer heat. I can see bug bombs working if done correctly, but I don’t recommend it. You don’t want to be inhaling the residue the next time you blast the air. I wouldn’t count on the summer heat killing them. I’ve seen them survive several minutes in the microwave. Solutions involving powders such as boric acid and diatomaceous earth seem like a good idea. They work so well inside roach infested homes, so why wouldn’t they work here? They will kill the roaches, but do you want to be breathing them? Turning on the heat or a/c will blow them into the small space of the car. You and your kids (if you have any) will be breathing them in. Although they aren’t particularly toxic to humans in small doses, inhaling them could still cause serious problems. What you need to use is a combination of cockroach traps and roach baits. Place the baits on disposable plates, so you can move them out of the car during the day. This allows you to keep them out of reach from children and pets if you have any. Place them back in the car at night. Cockroaches are nocturnal anyways, so they won’t do much feeding during the daytime. Be persistent with this because it will take some time for it to work. It will take at least a couple of months. To keep it simple, you need to keep the car clean and use a combination of roach traps and roach baits to get rid of them. As with any other method to remove roaches, you need patience and you need to be consistent with doing what’s needed to remove them. Basically, when you’re trying to figure out how to get rid of roaches in your car, it isn’t much different from trying to get rid of them from your home.